Early Morning Venus and JupitersteemCreated with Sketch. 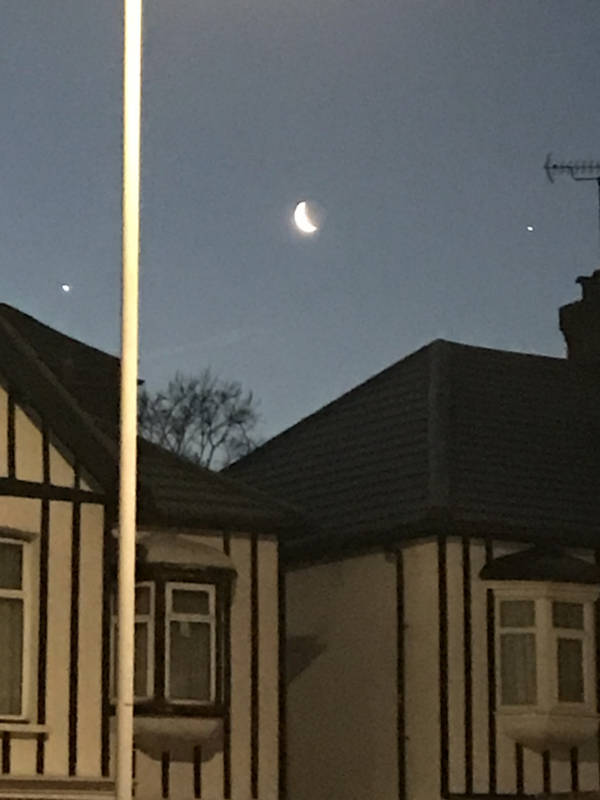 Had an early morning start a few weeks back and managed to snap Venus and Jupiter either side of the Moon. Photo was taken on a iPhone 7 and I was alerted to the event by one of the free Star Gazing Apps which I would thoroughly recommend if you have any interest in Astronomy at all. You get notifications of upcoming events and a Star map which shows you exactly where in the sky to look, no longer is there a need for charts or maps of the sky or the need for a compass. If you have an Interest in Astronomy I recommend the following book which is published by Collins from the Royal Observatory Greenwich. The book gives a good guide to all there is to getting into Astronomy and observing the night sky. Your steem username backs up your comments! I wonder if we can get the app on Android. My 9 yo loves astronomy, much like his father. Thanks for the book recommendation, will check it out we do get him tons of astronomy books, but mostly gearing for little kids. Absolutely should be able to get the Apps on Android, annoyingly a lot of them though free have ads which can get annoying, which was why I didn't name any but they are really good tool for Astronomy. I was about your son's age when I got started its a great hobby but having to go out in cold nights is definitely a problem. we have 2 humble telescopes that we use often. the boys (5 and 9 years old), love using them to see the sky and whatnot :) we live downtown now, can hardly see the sky. too many lights. Amazing Photography !!! Thanks for sharing ! Amazing the photo you showed us @stimp1024, I had never seen anything like that. Your UA account score is currently 3.535 which ranks you at #6391 across all Steem accounts. Your rank has improved 6 places in the last three days (old rank 6397). In our last Algorithmic Curation Round, consisting of 210 contributions, your post is ranked at #128. You got a 6.17% upvote from @brupvoter courtesy of @stimp1024!